What The Hell Is This Strange Green Glow Inside The Fukushima Plant? 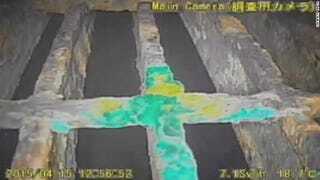 A second robotic probe has investigated the interior of Japan’s stricken Fukushima nuclear power plant. Using its onboard camera, it sent back eerie images of the plant’s interior, including what appears to be a mysterious green glow. Earlier this month, Tokyo Electric Power Company (TEPCO) dispatched the first of the shape-shifting robots to survey the plant, but it had to be abandoned after it got blocked by an obstacle. The second robot, dispatched on April 15th, fared much better. As CNN reports, the robot detected lower-than-expected radiation levels and temperature. TEPCO says this may be a good sign that cooling systems are working effectively. The radiation dose was about 4.7 to 9.7Sv/h — less than a tenth of what was expected. Temperatures were around 65 degrees F (18-20 degrees C). This bodes well for future clean-up efforts. Watching the video, you can actually see steam rising up from the basement floor. As for the glow, very little is being said about it aside from CNN’s limited coverage. After watching the video, however, my first thought is that it’s some kind of video artifact; the “glow” seems to disappear when the angles change. That said, there does appear to be some kind of substance on the grates. It’s a myth, by the way, that radioactive objects glow green. But if these metal grates are truly glowing, it may be the result of fluorescence, which is harmless. Less likely, it could be Cerenkov radiation, but the conditions at Fukushima don’t really support this possibility. Alternately, it could a spectral emission or incandescence, but none of these things would cause something to glow green. What do you think? Let us know in comments.